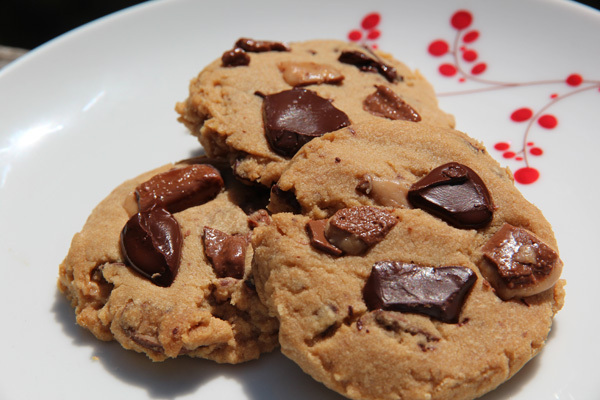 If you like coffee Heath Bar ice cream, you’re gonna love these toffee cookies. They aren’t the prettiest ones around – the edges can be a bit jagged – but they are rich and buttery, crumbly and satisfying, filled with coffee flavor in the dough, which is packed with nuggets of Heath Bars and semisweet chocolate chunks. The melted white chocolate in the dough adds sweetness and richness and is a perfect foil for the slight bitter edge of the instant espresso powder dissolved in the vanilla extract. You don’t really taste the white chocolate; it just provides a velvety mouthfeel and full dairy that make this cookie unusual. Expect a shortbread texture with even more richness. Position racks in lower third and upper third of oven. Preheat oven to 325° F. Line 2 baking sheets with parchment paper. Whisk flour and salt together in a small bowl to aerate and combine; set aside. Melt the white chocolate in the top of a double boiler or microwave; stir until smooth. In a large bowl with an electric mixer on medium-high speed, beat butter until creamy, about 2 minutes. Add sugar and brown sugar gradually, beating until light and fluffy, about 3 minutes, scraping down the bowl once or twice. Dissolve the instant espresso powder in the vanilla, then beat into butter mixture. Beat in melted white chocolate. Add about one-third of flour mixture and mix on low speed. Gradually add remaining flour mixture, mixing just until blended. If mixture appears crumbly, use your hands to bring it together. Stir in chocolate chunks and chopped toffee bars. Drop by generously rounded tablespoon 2 inches apart on cookie sheets. Flatten cookies with palm of hand to about ½-inch thickness (this is a necessary step). Bake for about 20 to 25 minutes or until just beginning to turn light golden brown. The centers will still be a bit soft. Do not over bake. The cookies firm up tremendously upon cooling. Place sheets on racks to cool cookies for 2 minutes, then remove cookies from sheets and place directly on racks to cool. Store in airtight container at room temperature for up to 1 week. For the toffee cookies in the picture we pressed a few chunks of candy bar and chocolate chunks on top of each cookie right before baking.